A document titled "Nonalignment 2.0-A foreign and strategic policy for India in the twenty first century" -- the product of collective deliberations of Sunil Khilnani, Rajiv Kumar, Pratap Bhanu Mehta, Lietenant General (retd) Prakash Menon, Nandan Nilekani, Srinath Raghavan, Shyam Saran and Siddharth Varadarajan -- was released on Tuesday in New Delhi. The group's activities were administratively supported by the National Defence College and Centre for Policy Research, New Delhi. One of the chapters in the document titled 'Asian Theatre' has quite elaborate comments on China, and opines that India's China strategy has to strike a careful balance between cooperation and competition, economic and political interests, bilateral and regional contexts. Rediff.com publishes verbatim a part of the chapter 'Asian Theatre'. China will, for the foreseeable future, remain a significant foreign policy and security challenge for India. It is the one major power which impinges directly on India's geopolitical space. As its economic and military capabilities expand, its power differential with India is likely to widen. As is well known, India and China have long-standing disagreements on an agreeable border. Skirmishes and incidents have occurred across the Line of Actual Control. Our strategy should be to 'hold the line' in the north on the Sino-Indian land frontier, but maintain and, if possible, enlarge India's current edge in the maritime south. Click here for more Realtime News on Sino-Indian ties! 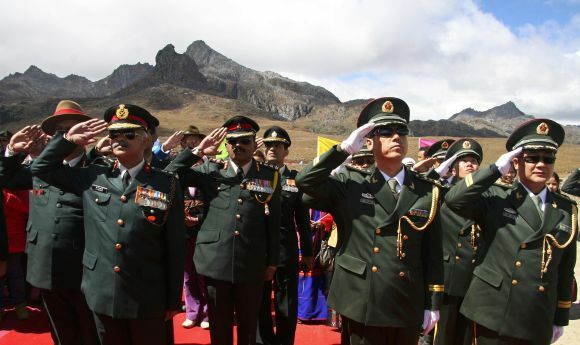 This strategy takes into account both the superiority of current Chinese deployments and posture on the land boundary, and the unlikelihood of the border issue being resolved in the near future. Given that China has managed to settle many of its border issues (at least for the time being) with other, smaller neighbours, the dispute on the Indian border stands out quite prominently. It is significant that on his last visit to India, Chinese Premier Wen Jiabao stated that it would take a long time to settle the boundary issue. This is a departure from the earlier position that the mechanism of Special Representatives could try to achieve a political settlement of the issue, taking advantage of the fact that relations between the two countries had now acquired a strategic and global dimension -- which made the early settlement of the border issue, both possible and necessary. This has evidently changed. It is important that we accelerate the upgradation of our border infrastructure (especially in terms of habitation and supply lines) to reduce the asymmetry in our capabilities and deployments. At the same time we must put in place operational concepts and capabilities to deter any significant incursions from the Chinese side. Currently India has the edge in terms of maritime capabilities but China is catching up rapidly. China's current focus is on acquiring dominance in the Yellow Sea, the Taiwan Straits, the East China Sea, and the South China Sea. The Indian Ocean falls second in the present order of priority. 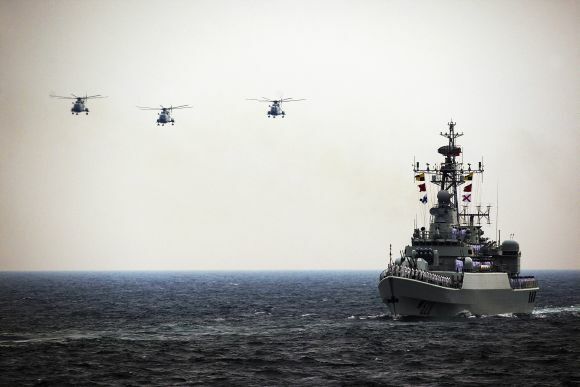 It is in our interest that China remains preoccupied with its first-tier, more immediate maritime theatre. The retention of strong US maritime deployments in the Asia-Pacific theatre, a more proactive and assertive Japanese naval force projection, and a build-up of the naval capabilities of such key littoral states as Indonesia, Australia and Vietnam: all may help delay, if not deter, the projection of Chinese naval power in the Indian Ocean. We need to use this window of opportunity to build up our own naval capabilities. Our regional diplomacy should support this approach by fostering closer relations with these 'countervailing' powers. This should include a network of security cooperation agreements with these states and regular naval exercises with them. On the political side, our posture towards China must be carefully nuanced and constantly calibrated in response to changing global and regional developments. China's threat perception vis-a-vis India has both a local and a global dimension. The local dimension involves Tibet. Our Tibet policy needs to be reassessed and readjusted. Persuading China to seek reconciliation with the Dalai Lama and the exiled Tibetan community may contribute to easing India-China tensions. The initial soundings must be discreet and exploratory. And we must be mindful of the risk of hostile reaction, particularly from conservative sections of the People's Liberation Army. The situation vis-a-vis Tibet has been complicated by the transition to a democratically elected Tibetan government-in-exile. 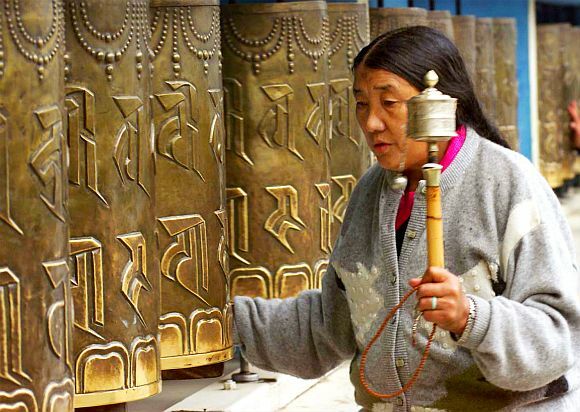 The Chinese had, in part, expected that the Tibetan community would continue with its traditional method of selecting the Dalai Lama -- a method that was amenable to manipulation by China. The Dalai Lama's popular legitimacy among his own people is a fact that the Chinese government must acknowledge. On the global canvas, China looks upon India not as a threat in itself, but as a 'swing state' whose association with potential adversaries could constrain China. The challenge for Indian diplomacy will be to develop a diversified network of relations with several major powers to compel China to exercise restraint in its dealings with India, while simultaneously avoiding relationships that go beyond conveying a certain threat threshold in Chinese perceptions. This will require a particularly nuanced handling and coordination of our foreign policy, both through diplomatic and military channels. If China perceives India as irrevocably committed to an anti-China containment ring, it may end up adopting overtly hostile and negative policies towards India, rather than making an effort to keep India on a more independent path. India-China economic relations also present a complex and somewhat ambiguous picture. Bilateral trade is rising rapidly but asymmetrically, with a growing trade surplus in favour of China. We could respond by trying to limit Chinese penetration of our market, particularly our infrastructure market. Or, we could allow access but with various conditions that safeguard and promote Indian interests in other areas. Given the fact that India's infrastructure market is likely to be in the region of a trillion dollars in the next few years, China would obviously have a keen interest in expanding access to it. We should see this Chinese economic interest as a point of leverage for trade-offs favourable to us in other sectors, including political concessions in areas of interest to India. 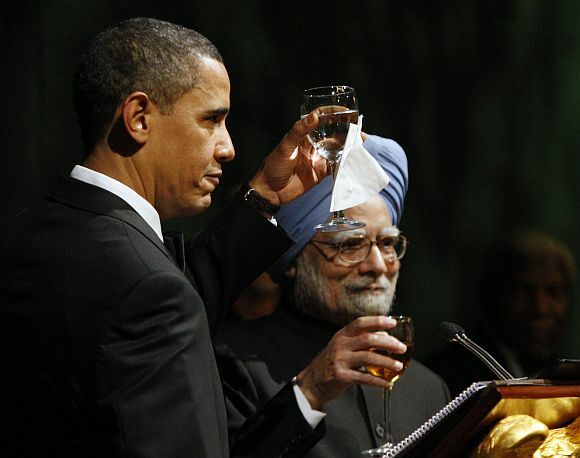 Image: US President Barack Obama and PM Singh make a toast during a state dinner at the White House, on November 24, 2009. One of the big concerns in our economic relations is the involvement of China's state-owned enterprises. 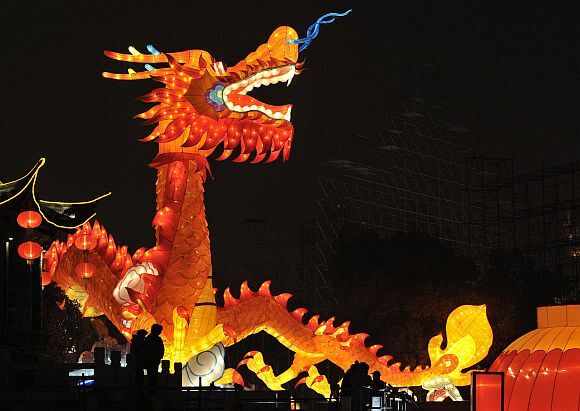 Chinese banks are often able to offer preferential financing to Chinese companies because of their scale and because they are not driven solely by market forces. Many of China's premier manufacturing firms are also state-run, and thus have access to such financing. 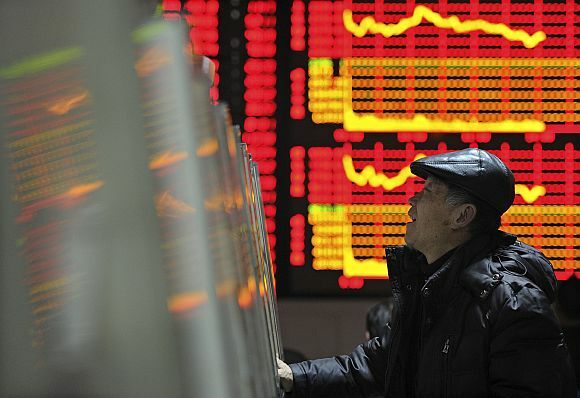 This means that when Chinese companies participate in competitive bidding for open tenders, they may actually have a big advantage over other bidders, which allows them to place stronger (lower) bids. However, such preferential financing could also be a useful asset in terms of the volume of infrastructure financing we need so there are multiple questions to be considered here. How India should systematically respond to such issues is an important, open question. There is the additional problem of the potential for espionage and intelligence gathering through software means, which was evidenced by the banning of import of Chinese telecom equipment. Given the asymmetry in the economic and trade relationship, we should not overestimate our bargaining power. It may be more realistic to link large orders to economic and trade concessions, including fixed investments in India-based facilities. It is also reasonable to expect that growing economic interdependence might help make the political relationship more manageable and less subject to oscillations. The growing trade surplus between India and China has been a cause for concern owing both to its degree and composition. Not only is the degree of dependence of Indian industries on Chinese imports on the rise. But India's main exports seem to be natural resources, whereas its imports are largely higher end manufactured goods. Given India's large services sector, it should be pushing for greater market access and presence in China to correct this imbalance. One area where India may be able to bargain effectively with China is the domain of technology transfer. The ability to leverage access to our markets in order to secure access to sophisticated technology, and so develop domestic capacity is something India has not been able to do as effectively as it needs to, especially with developed countries. For example, when an airline company like Indigo signs a $16 billion (around Rs 83,200 crore) deal with Airbus, technology transfer should be a part of the terms of negotiation. Even India's defence offsets have been quite disappointing in terms of technology transfer, with only the lowest value addition activities being sourced domestically. China has managed to do this quite well, mainly because the government is able to coordinate the actions of various companies (many of which are state-owned), while India does not have this luxury. It may in fact be easier to negotiate technology transfer deals with China than other developed countries, which are intensely possessive about their intellectual property. Huawei, a telecom company from China, has recently agreed to set up a research facility in Bangalore to ensure that none of its imported devices contain any kind of covert listening technologies. India's China strategy has to strike a careful balance between cooperation and competition, economic and political interests, bilateral and regional contexts. Given the current and future asymmetries in capabilities and influence between India and China, it is imperative that we get this balance right. This is perhaps the single most important challenge for Indian strategy in the years ahead. KIND COURTESY: National Defence College and Centre for Policy Research, New Delhi. 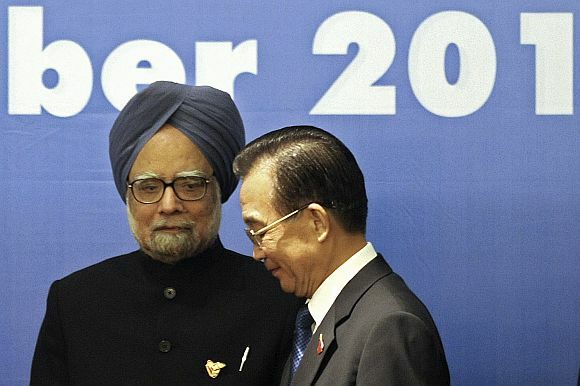 Image: China's Premier Wen Jiabao walks past PM Singh ahead of a photo opportunity during 5th East Asia Summit in Hanoi, on October 30, 2010. Is US indirectly asking India to contain China?